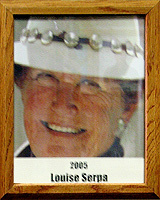 Louise was born in 1925 and grew up in the “high society” world of New York. As a child she took a trip to Nevada and fell in love with the “Old West.” As a teen she worked on a dude ranch in Wyoming and did not know “rodeo” until she met rodeo cowboy Lex Connelly in 1943. She had no use for the sport and went back to New York to study opera at Vassar and perform with the USO for troops during World War II. But the lure of rodeo was there, and after a failed marriage, she ventured out West for a fresh start in search of new opportunities. She ended up in Nevada where she met and married cowboy Gordon “Tex” Serpa in 1953. They had two girls, but sadly her marriage fell apart and Louise moved to Tucson with her two daughters. Once here, she took her “hobby” of taking photos of cowboys and turned it into a career. Desperate for money, she began to sell her 5×7 black-and-white photos to the local cowboys for 75 cents. Never trained professionally as a photographer, by 1963 her natural ability to anticipate action gained her entry into the professional arena. She was then given a press card and became the first woman ever sanctioned by the Rodeo Cowboy Association to be inside a rodeo arena. For more than 40 years Louise has been photographing the world of cowboys and rodeo. She also became the first woman permitted on the course of the Grand National Steeplechase in England and to shoot in the ring at the Dublin Horse Show. She has published a book, been featured on PBS and is enshrined in the Cowgirl Hall of Fame. With a $27 camera, Louise became the Ansel Adams of sports photography.